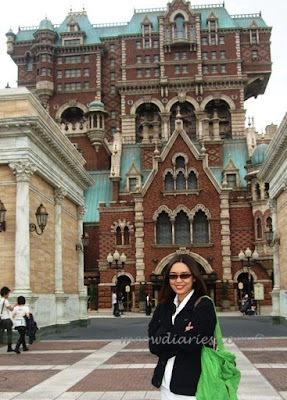 Did I tell you we went to DisneySea while vacationing in Tokyo? We saved the best for last and spent an entire day there. I'll write more about our visit later but right now, let's see what awaits us at the terrifying Tower of Terror. 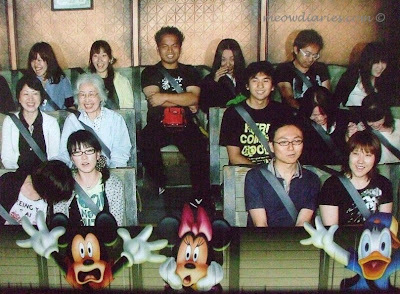 Riding the Tower of Terror was an exhilarating experience like none other! It almost feels like I'm one of those Online Casino US Players! The moment you enter a casino, you can already feel the buzz of excitement in the air. As you make your way through the crowd, you decide just which machine has your name written on it. You take in the sounds of the slots and money pouring out as some lucky winner strikes it rich. You suddenly feel excited and you can't wait to feel that rush of excitement from winning too. It's fun; it's exciting and a little scary all in one, which were what coursing through me when I decided to ride this attraction! Let me tell you a little background history about this attraction. Apparently, this hotel tower was owned by Harrison Hightower III; an extremely rich explorer and collector. On New Year's Eve 1899, he had planned an elaborate press conference in his luxurious Hotel Hightower to reveal his latest discovery, a strange statue named Shiriki Utundu. On that fateful day, the elevator that Mr. Hightower was taking to transport his statue to the hotel's penthouse crashed down to the ground without warning! Mr. Hightower was never found and the only thing salvaged in the elevator was the mysterious Shiriki! The tour of the hotel starts in the lobby. Here you can see the destroyed elevator where the fateful accident occurred. We were then ushered into a private-office room, to listen to the story of what happened that night. I might not be able to understand Japanese but there was no mistaking the urgency and fear in his voice as the narrator laughed eerily into the darkness. At that time, I was still calm, cool and collected. I mean, how bad could the ride be? We continued our tour and finally reached the service elevator where it all happened. We took our seats and put on our seat-belts. It was pitch dark inside and everyone were already whispering and talking in anticipation of what's going to happen next. The elevator makes its way to the top when halfway through, we encountered the scary Shiriki himself who cast a spell on us! While still recovering from the shock of our scary encounter, the elevator door opens and everyone caught their breath as we took in the amazing bird's eye view of DisneySea, all the way from the top! Yowzaa! We're going down with Mickey and gang! Before I could even gear myself to hold on tight, the elevator suddenly drops in a freefall at such tremendous speed that all I could do was laugh! I laughed from fear, from the funny feeling in my stomach, from the tears that were threatening to spill at any moment; it was outrageous! While laughing and shrieking in hysterics, I closed my eyes and hoped for the best. The elevator stops short of crashing to the ground and we eventually end up safe and sound back on the ground floor. I could breathe easy again but my knees were shaking as I wobbled out of the ride, into B's waiting arms who did not join me by the way, for fear of feeling dizzy it seems! 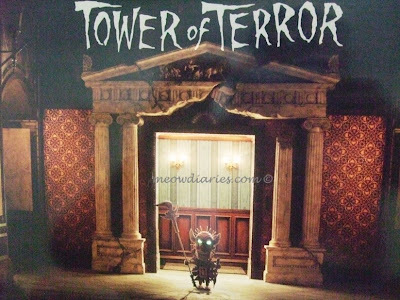 Experiencing the thrilling Tower of Terror is a must for all DisneySea visitors. If you don't go on any other thrill rides, this one is a must-not-miss. I'm so glad I made the scary decision to go for this ride. I needed to do something outrageous, to shake the youth within and remind me that life is just awesome! That heady rush of excitement and fear of the unknown and what's going to happen next gave me the rejuvenation I needed. It almost feels like winning a million bucks in a fancy casino! OMG! I think if I were to ride on it, I won't scream but I'd laugh hysterically like you did, Marzie!!! Why la all the guys mcm takde perasaan? LMAO!!! Kamon Meow 3, where are u? Hahahahahhaah kenot tahan la Debbs, automatically terlaugh, scared at the same time but there’s nothing u can do so just laugh! ROTFLMAO! Takut dizzy it seems Debbs cause the last time he went on something similar, dizzy after dat. 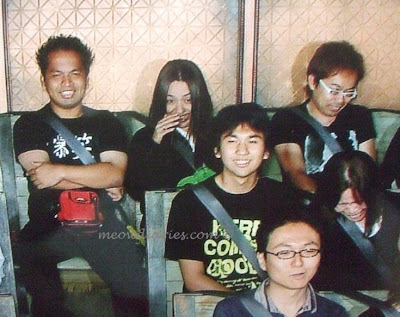 So I went on the ride with his fren, the guy next to me ha ha! Tu la, kelakarnya dat time, then see the pic, we too noticed the makcik so cool like dat ha ha! Happily smiling! LOL!! Dunno Debbs, padahal I was screaming and laughing there, had to peluk B’s fren without shame cause scared hahahahahha!!! Oh no, what is up with screamyx Mon? When u gonna call to throw tantrum?! Sebab the gravity pull kan, makes you feel geli hati if you know what I mean lol!! Always disconnected nowadays Mon, wonder what’s goin on…. Yeah la, B’s colleague dat one, but he’s so funny la, teman me go shopping at Lush all hahahhaha! LOL but later we took the Indiana Jones Ride, and he went on dat one he he! Meow 3 sleeping it seems, hurry up Meow 3! lol where is Meow 3? I experienced similar prob last month, screamyx acting up again…. Maxis connection has been acting funny too recently, Mon. I almost called them just now lol! Yeah! He claims I made him a Lush convert, happily buying and sampling stuff hahaha, so funny! Yeah, felt so rejuvenated and free like dat Mon! yalor if u don see me, it means i fed up wz screamyx edi! LOL! u 're using Maxis broadband Debbs? Silly screamyx, silly ec lol… hey Debbs, I don understand my LW earnings la! LOL! Still up Mon? Woosh woosh chop, go for it! Apa yg u tak understand about your LW earning, GP? Email me ok? I tak faham la my amount…ok will email you! Not even Sunway Lagoon lol!! Astaga, go la Sunway Lagoon and make a day of it! I had a blast Anny dear, I recommend Japan to everybody, go la! And hey, meow 3! :) Thanks for chopping sweetie! LOL Jean! His hair mmg spiky! i admire your guts. as for me, i'll die of heart attack instantly. Ahak.. macam best tuu naik mender tuu walaupun boleh kecut perut. Even yang naik kat Genting Highland pun sama. Kelakar tgh tgk pemandangan yang indah keliling.. tetiba benda tuu jatuh. Ooh! What a scary ride! Free fall! Such a thrill! I must ride this next time I go Disney! LOL spooky right??? Now imagine ur inside the elevator, pitch dark and he suddenly appears at the screen…yowzaaaaa! wah.. sounds so thrilling GP!! would love to go on the ride! !